and a little bouquet of flowers from the sweets. on a little rustic shabby antique table. with acorns and the faded silvery color of the mercury glass. 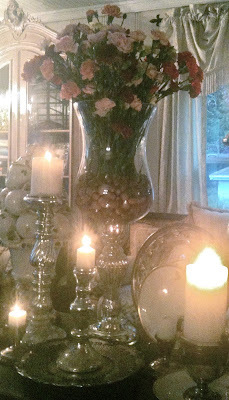 Lots of white candles aglow add a warm and inviting ambiance as early evening falls. Go visit for some fantastic inspiration!! The candlelight is wonderful in your pics! So pretty! I love mercury glass! You take stunning night pictures. I adore mercury glass. Wow...how pretty! I bet your house looks amazing, all lit up, at night. I love mercury glass. Beautiful! Ohhh my goodness...absolutely gorgeous! Of course, I am a lover of all things silver! 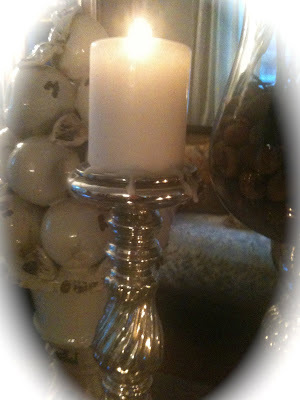 I just adore all of your mercury glass candleholders...they're sooo beautiful! I also enjoyed that fabulous retriculated silver plate! I have never seen anything like it...ohhh, and I would love to have some! Exquisite! 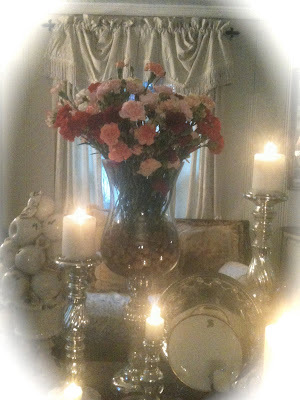 Your floral bouquet and vignette of exquisite silver is FABULOUS!!! Thank you so much for sharing it with us today! Pretty pretty...I love the shimmer of mercury glass with all of the off whites. But tell me, what do i see in the background? That fab glass doored cabinet with a carved top? What room is this?? I want to see more! 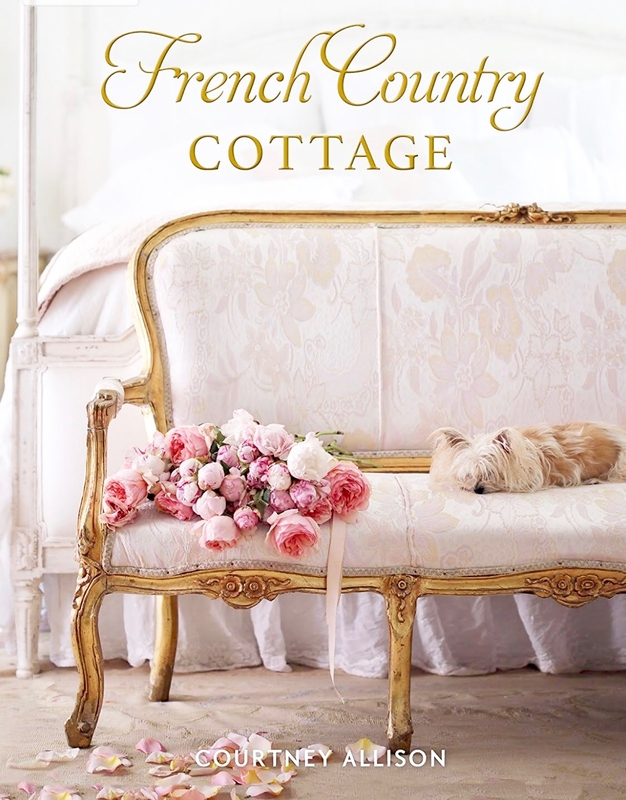 PS Thanks for putting the French Inspired Home Book giveaway on your sidebar! So sweet, and you get two chances to win!! You would love this book! I love it.I am a fan of anything with Mercury in it and you captured romance perfectly! Gorgeous Courtney! I felt like I was peeking through the windows of a beautiful French boutique! 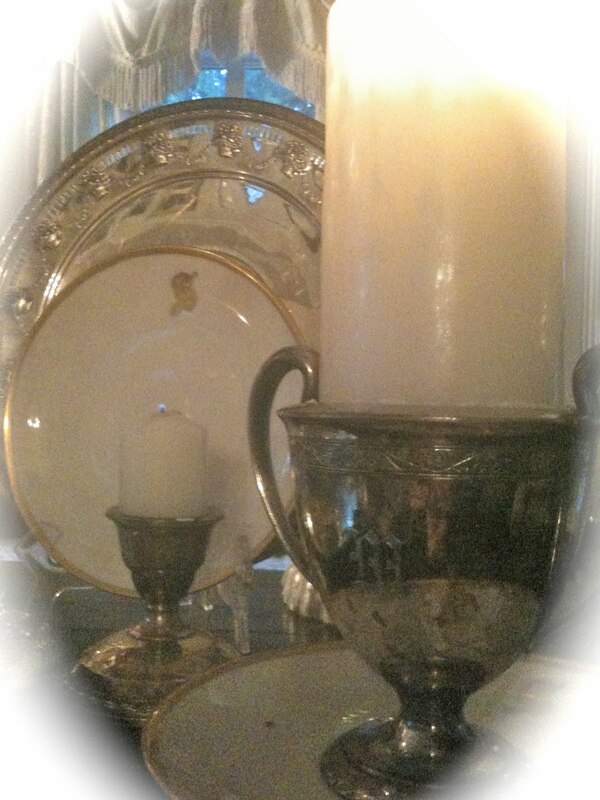 I love how the mercury glass looks on top of the antique silver tray! Happy November to you too ~ just lovely! So pretty! Mercury glass is one of my favorite things! All your silver pieces look so gorgeous. Gorgeous photos, I especially love the mercury glass, absolutely beautiful!!! 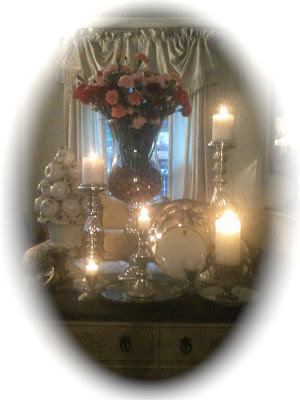 Hi Courtney, I Love your silver and mercury glass vignette. Everything is beautiful!! Please show us the Frenchy cabinet in the background of your photo. It looks fabulous. I just love mercury glass! Can't get enough of it! Your urn of apples...I think I've seen that before! As in, I wanted to buy it, and didn't and now I wish I would've! :( boo. Looks great in your vignette! Hi Courtney, I've never ever seen cut silver like that! It's gorgeous as the other pieces. And thanks for visiting with me and your kind words. This is so pretty! I love anything mercury glass. It just seems to catch the light and glimmer!! There's something so captivating about mercury glass. I love your photos with the soft candlelight! Just beautiful! I love the silver and mercury glass and white all together. So classic and calming. I am thinking of using that combo in my bedroom. Your pictures are beautiful and capture the mood perfectly. Love all those mercury glass canlde holders...MMMM!!! Thanks for visiting me @ JUNK WILD and becoming a follower...here's to us in wonderful Blogland! Silver, mercury glass, candles, oh my! Love it all. Your pictures are wonderful! These are so beautful all grouped together like this. I've just bought some new ones to add to my collection. New...I know, not quite the same as vintage but there are none to be had round here. Your pictures are so lovely! The mercury glass is lovely, but the flowers from your little one are the best! I'm such a sucker for mercury glass. Very pretty photos. This pics are so soothing! Perfect for Christmas too! 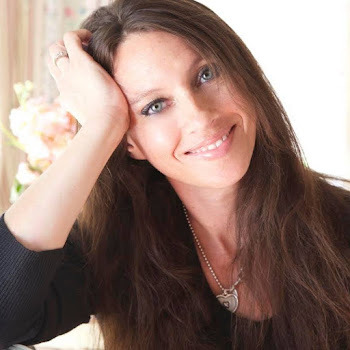 Thanks for stopping by my blog...I'm playing catch up! Love it! Can't wait to unpack my silver mercury glass Christmas ornaments and play! The silver and white made a dreamy vignette. Beautiful post, thanks for the inspiration. I just noticed your picture with Rachel Ashwell, I did a post on her too. Was this at Remnants of the Past in October? Sigh...I just want to come and live at your house Courtney. This vignette is just beautiful. 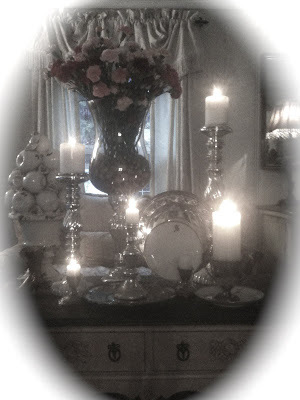 I love all the silver and mercury glass, with the candles reflecting off of them. So, so beautiful! 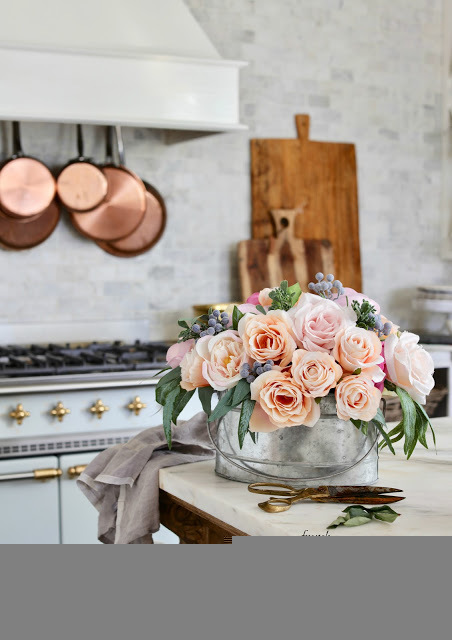 Mercury glass is so romantic, love that fabulous floral arrangement. It's all so pretty together! I love the look! 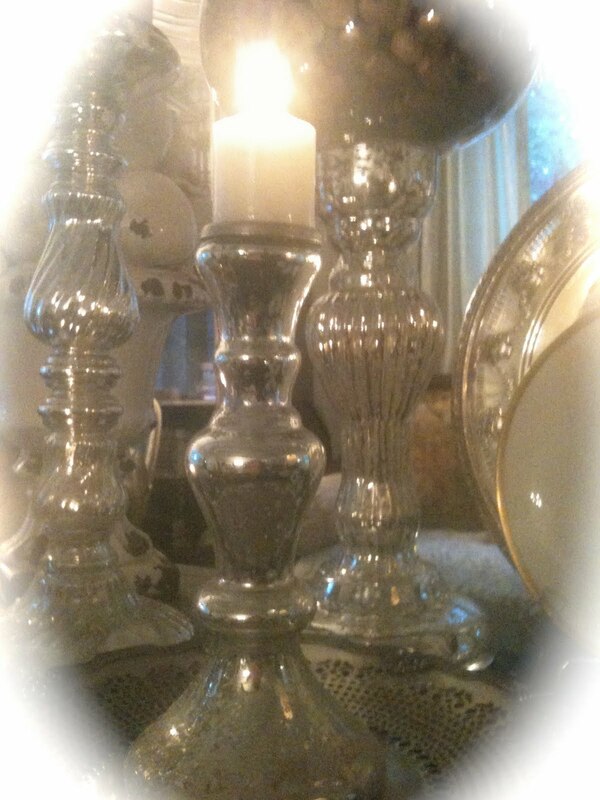 Mercury glass and white candles...has me swooning. I'm hoping to create this look in my foyer. 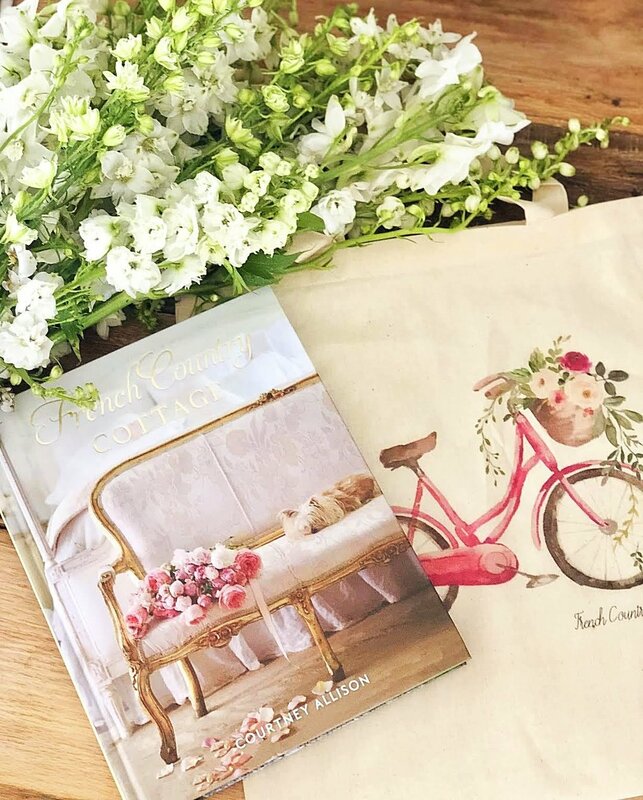 Thank you for linking up to the first ever "Amaze Me Monday" blog party.